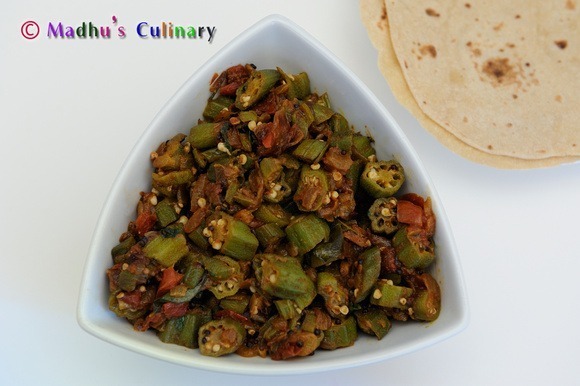 Masala French Fries ->Suvayo Suvai | Simple Vegetarian Recipes, Easy to prepare and healthy to eat! Wash the Russet Potato to remove dirt from the skin. Peel the skin and cut the potato into 1/3 – 1/4 inch slices. 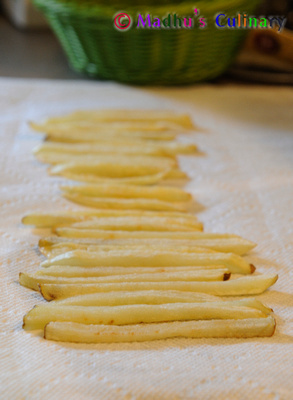 Then cut the slices into sticks of 1/3 inch or to your desired size length wise. 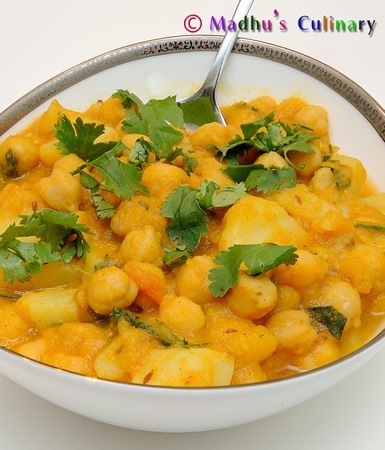 Add the cut potato sticks to a big bowl, add water and rinse/wash them multiple times to remove the Starch. Wash them until the water looks clear and not pale white. After washing, add fresh clear water and soak the potato sticks for a minimum of 2 hours (you can do up-to 1 day). 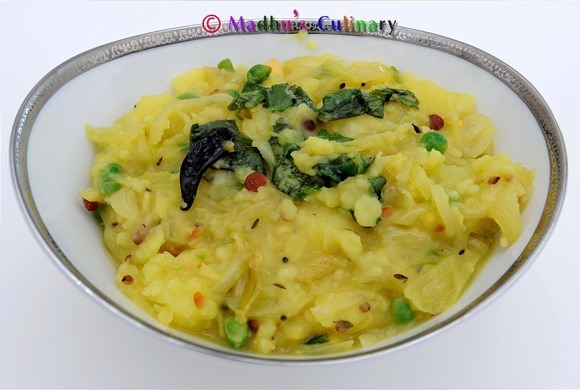 This will help remove any excess starch and prevent them from oxidizing (the potato should look fresh and white). 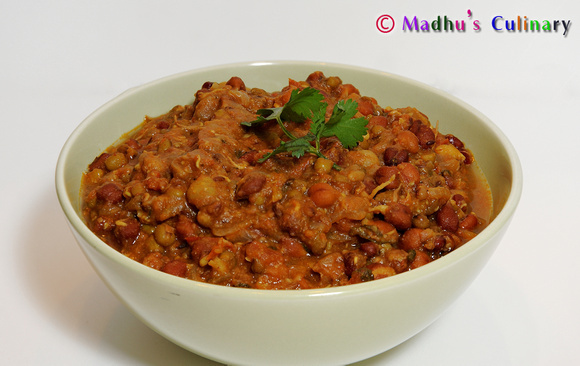 During this time, prepare the Masala seasoning to sprinkle over the fries – Add Salt , Chat Masala and Red Chilli Powder and mix them and keep it aside. Take a Kadai and add the Canola oil and heat in Medium flame/heat (if you have a deep fry thermometer, measure it to 250F). There should be at least 1 in of oil above when the potato is put in. 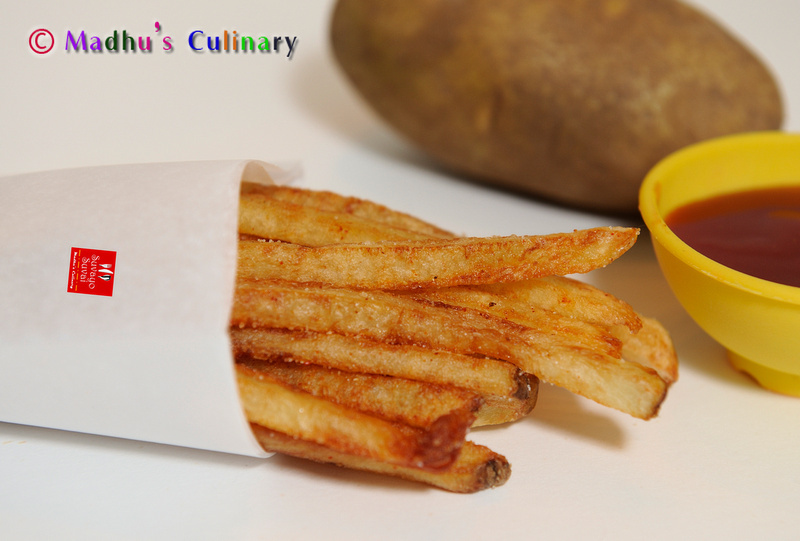 While the oil is heating, take the Potato sticks and pat dry them using a paper or cotton towel to remove excess water. Add around 15-20 sticks (or 2 handful) in the hot oil and fry/cook them. Cook for 6-8 min until it turns light brown. Take the Potato out and drain them in a paper to remove excess oil. After this process, it shouldn’t look shining. At this stage the Potato should be tender. Repeat the process for the rest of the Potato sticks. Now heat up the same oil in the Kadai in High flame/heat (if you have a deep fry thermometer, measure it to 350F). 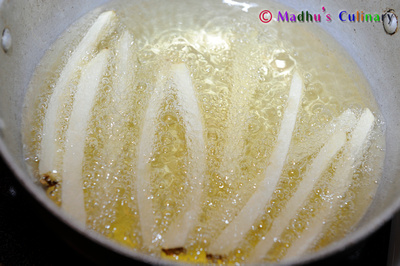 Add around 15-20 oil dried Potato Sticks back to the hot oil and fry until it turns golden color (around 2 min). 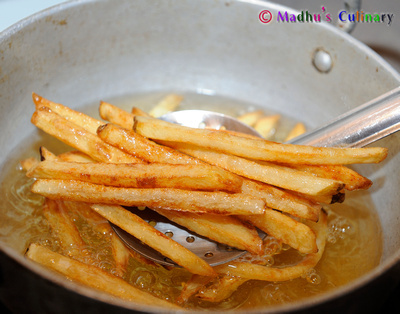 Remove the Fried Potato Sticks (aka French fries) by draining oil and put them in a clean bowl. 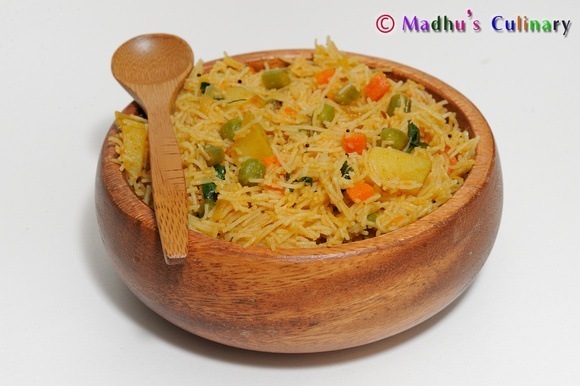 Sprinkle the Masala Seasoning over the French Fries and toss and mix them. Repeat the process for the remainder of the potato sticks. 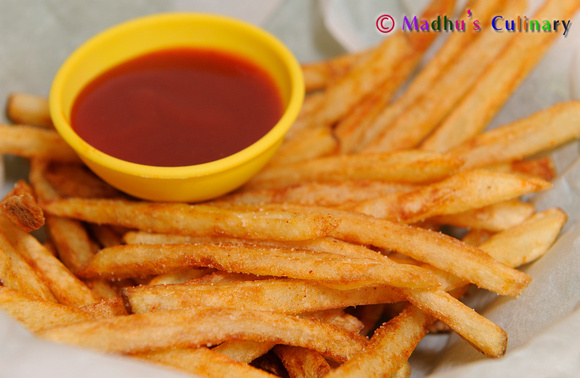 Enjoy the Masala French Fries with Tomato ketchup. 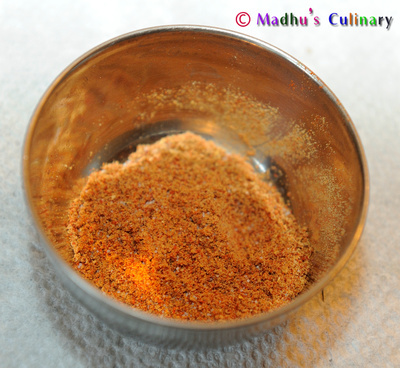 For seasoning, instead of Masala Seasoning, you can just sprinkle Salt as needed and toss.